It is our great pleasure to welcome you to SPAWC 2009 in Perugia, Italy. As in previous years, this workshop features poster presentations and invited plenaries on recent advances in signal processing for wireless communications, as well as for communications and networking in general. The workshop is being held in Perugia, roughly in the center of Italy, in the region of Umbria, known as the "green heart of Italy". 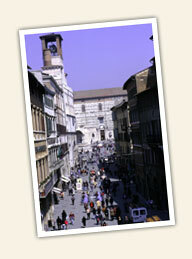 The historical center of Perugia, in its entirety, is a splendid epitome of arts and civility in Italy. It combines scenic beauties with both medieval and modern architectural interests. There are several important museums such as the Archaeological Museum and the National Gallery, with a collection of Umbrian and Tuscany paintings from the Middle Ages to the Renaissance and considered as one of the most important and richest in Italy. There is also a wealth of artistic beauties inside the city like the "Piazza IV Novembre" (the heart of Perugia), the "Palazzo dei Priori", the "Corso Vannucci", the "Arco Etrusco", the "San Lorenzo" Cathedral, the "San Pietro" Church, the "Rocca Paolina", and the "Collegio del Cambio". Outside the city, neighboring towns like Assisi, Siena, Orvieto, Gubbio, Todi, Spello, and Spoleto, as well as the Trasimeno lake, promise to make the venue attractive for accompanying people and families. In order to let the attendee fully appreciate and enjoy the historical atmosphere that pervades the city, the workshop itself is held in close-by locations, located in the center of the medieval city. 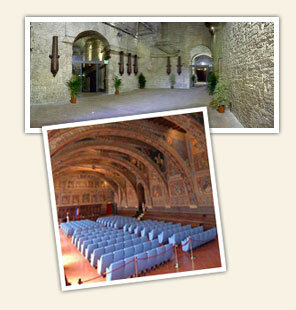 The poster sessions are located in the Rocca Paolina, a fortress built in the middle of the XVI century. The plenary talks are held in the Pavone Theater, which dates back to the beginning of the XVII century, and in the Sala dei Notari, built at the end of the XIII century. A gala banquet will take place Monday evening in the old Rosciano castle (VI century), while Tuesday afternoon will feature a special tour of the Basilica of San Francesco d'Assisi in Assisi (XII century). Perugia is a great place for a small, intimate workshop like SPAWC 2009, also because during the summer there are many open bars, restaurants, pubs, and other activities all around which guarantees a pleasant stay in a city with a great cultural and international atmosphere, due to the presence of its old university founded in 1308 and to the Italian University for Foreigners, which attracts thousands of students every year from all over the world. 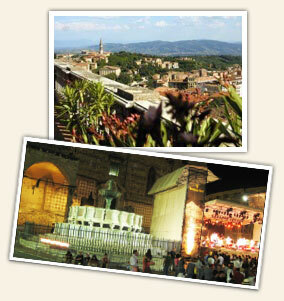 We sincerely hope that you will enjoy SPAWC 2009, and experience Perugia and all the wonderful highlights it offers!